First Time Customer? 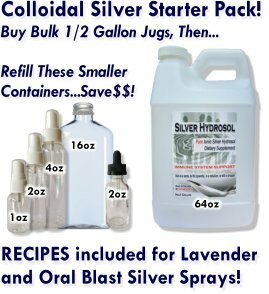 Buy Colloidal Silver Cheap! FOR OUR RETURNING CUSTOMERS - THANK YOU! "Why are you letting me buy colloidal silver hydrosol cheap?" Simple! We know there are a lot of products out there competing for your hard-earned money. We respect that! We want to earn and keep your business. 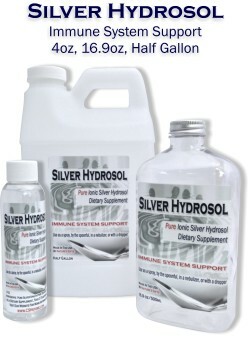 We don't know of anywhere else where it is possible to buy colloidal silver this cheap, only $10 for our NEW customers! For returning customers, we offer SUBSTANTIAL quantity discounts, easily competing with other manufacturers while offering the convenient, easy to use 16.9oz bottle, 4oz spray bottle and half gallon jug. Flat rate shipping of just $2.99 keeps costs down. Our 16.9oz bottle represents a one month supply when taking it as a daily supplement of 3 teaspoons a day. Keep in mind that one teaspoon of pure ionic colloidal silver hydrosol at 6ppm has over 1000 TRILLION silver ions! And it's the silver ions that are what makes silver bio-active! Ionic silver is potent! I'm on a fixed income but a firm believer in natural helpers like colloidal silver. Your deep discounts make it very affordable for me to continue to benefit from this miracle of nature!" "I needed a way to atomize your product to take with me on the road. I like to spray my throat all day long anytime that it feels scratchy but I don't like using OTC meds. So I found a perfume atomizer that does the trick!! I'm also able to inhale the mist too!"